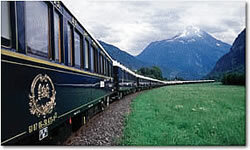 .Canada is home to some of the most scenic rail experiences in North America, including the Rocky Mountaineer®, with trips ranging from two to fifteen days from Vancouver, Calgary or Seattle. Mexico's Copper Canyon is one of the most spectacular railroads in the world, climbing more than 8000 feet to cross the mighty Sierra Madre Range. With plenty of itineraries to choose from. 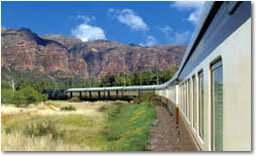 The United States affords nearly unlimited possibilities in regards to scenic and historic rail trips.. 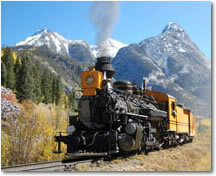 Whether it be a day trip on Verde Canyon RR, or an Alaskan adventure, we have them. Come experience Africa aboard some of the most luxurious trains in the world, including The Blue Train , Rovos Rail and the Shongololo Express. But book early, as trains often sell out almost a year in advance. Whether you are looking to step back to the bygone era of the 20s and 30s aboard the lavishly restored Orient Express, or one of our many other exciting European rail adventures, we look forward to hearing from you soon.